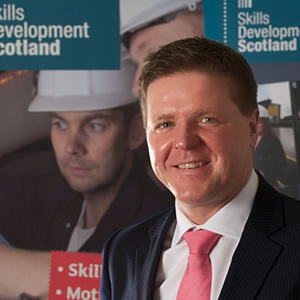 Chris Brodie is the Lead Head of Skills Planning and Sector Development at Skills Development Scotland. Chris leads a team of more than 30 staff who are responsible for developing a robust, industry informed evidence base to inform the skills system in Scotland. He has directed the development of 12 industry-led Skills Investment Plans covering sectors ranging from Energy, Digital Technologies and Life Sciences, through to Tourism and Early Years Learning & Childcare. Chris also leads a team of Regional Skills Planning Leads who work with public sector partners and industry to drive stronger alignment of the skills system with the needs of the economy at a regional level. Chris joined SDS in 2012 and has 20 years’ experience in economic and skills development. Prior to joining SDS he was Managing Director of Slims Consulting and worked for a number of leading UK economic and regeneration consultancies.